The Mississippi Encyclopedia is expected be available online later this year, senior editor Ted Ownby said during a discussion of the book on Tuesday, Jan. 23, at the State Law Library in Jackson. The 1,451-page print edition that includes more than 1,600 entries by more than 650 scholars was published in 2017 by the University Press of Mississippi. The goal in producing the encyclopedia was to be scholarly, authoritative and accessible, Ownby told the gathering. Putting the work online will take accessibility a step further, and it will allow updates and more topics to be added. However, he lamented that some of the accidental discoveries one makes while leafing through printed pages may be lost in the online search. He and others who created The Mississippi Encyclopedia hope to find ways to keep the joy of browsing alive online. “Part of the pleasure of this book is that you go to look up something and you find yourself 45 minutes later or an hour and a half later reading something more intriguing,” Ownby said. 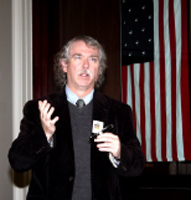 Ownby, of Oxford, is Professor of History and Southern Studies and Director of the Center for the Study of Southern Culture at the University of Mississippi. The Center took on the project in 2003 at the suggestion of Seetha Srinivasan, then the director of the University Press of Mississippi. 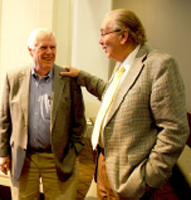 Ownby and Charles Reagan Wilson, former director of the Center, worked as senior editors with associate editors Ann J. Abadie, Odie Lindsey and James G. Thomas Jr. The Mississippi Encyclopedia is the first encyclopedic treatment of the state in 110 years. Not since Dunbar Rowland’s 1907 History of Mississippi has such a collective work been published. Two of the volume’s contributors, retired Supreme Court Justice James L. Robertson and former Mississippi College School of Law Dean Jim Rosenblatt, attended the book talk. Robertson, of Jackson, is known for his scholarly writing, but his topic for the Encyclopedia was something else that he holds dear: baseball. He authored the entry about Boston Red Sox first baseman George “Boomer” Scott. Both grew up in Greenville, but they never met until later in life. “I was just thrilled to do that,” Robertson said of his contribution to the Encyclopedia. Rosenblatt wrote entries about Mississippi College School of Law and U.S. District Judge Henry T. Wingate. “It was an honor to contribute to this literary work that will be of lasting value and interest to Mississippians and beyond,” he said. State Librarian Stephen Parks noted that the Law Library will observe its Bicentennial in a few days. Hosting Ownby for a book talk is among several special events. The Law Library had its inception in a resolution of the Mississippi General Assembly of 1818. Gov. David Holmes, the state’s first governor, signed the handwritten document on Jan. 31, 1818, authorizing the Secretary of State to purchase a set of the acts of the United States Congress and a digest of the laws of the states of the Union. The Law Library was officially established by an act of the Mississippi Legislature in 1838. Known officially as the State Library, the Law Library is a specialized public library which provides legal research materials to the judiciary, state agencies, lawyers, students and the general public. Its mission is to collect, preserve, and make available to the public the foundation of Mississippi law. The 265,000-volume collection includes state and federal legal sources including court decisions and rules, codes, regulations, law reviews and government documents as well as texts that explain law for laymen. The Law Library is located in the Gartin Justice Building at 450 High Street, along with the Mississippi Supreme Court and the Mississippi Court of Appeals. Hours of operation are 8 a.m. to 5 p.m. Monday through Friday.